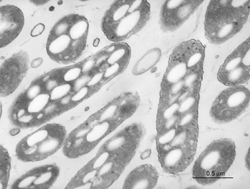 An anaerobic, facultatively autotrophic arsenite oxidizing bacterium that respires nitrate or nitrite (Oremland et al., 2002). It was isolated from Mono Lake, California after it was determined that addition of nitrate to anoxic lakewater resulted in the biological oxidation of arsenite to arsenate (Hoeft et al., 2002). It is a g -Proteobacterium (16S rRNA gene GenBank AF406554), located in the Ectothiorhodospira clade of photosynthetic bacteria that occur in soda lakes. However, strain MLHE-1 is not a phototroph, but does grow as an anaerobic chemoautotroph by linking oxidation of arsenite, hydrogen, or sulfide to the reduction of nitrate. It contains Form 1 RuBisCo genes for fixation of CO 2 during chemoautotrophic growth, but can also grow as a heterotroph on acetate either with nitrate or air. However, arsenite is only oxidized under anaerobic conditions. Geochemical evidence suggests that biological oxidation of arsenite with nitrate occurs in an As-contaminated freshwater lake (Senn and Hemond, 2002) and in the anoxic, subsurface aquifers of Bangladesh (Harvey et al., 2002). Since many of the drinking water aquifers of Bangladesh and other As-impacted regions are anoxic or suboxic, and the fact that nitrate is a common contaminant in such waters, this is very likely to be proven out to be an extremely important process in our understanding of As-mobility in the subsurface. Harvey, CF, CH Swartz, ABM Badruzzaman, N Keon-Blute, W You, MA Ali, J Jay, R Beckie, V Niedan, D Brabander, PM Oates, Kn Ashfaque, S Islam, HF Hemond, and MF Ahmed, 2002. Arsenic mobility and groundwater extraction in Bangladesh. Science 298:1602-1606. Hoeft S.E., Lucas F., Hollibaugh J.T., and Oremland R.S., 2002 Characterization of microbial arsenate reduction in the anoxic bottom waters of Mono Lake, California. Geomicrobiol J 19:23-40. Oremland R.S., Hoeft S.E., Santini J.M., Bano N., Hollibaugh R.A., Hollibaugh J.T., 2002 Anaerobic oxidation of arsenite in Mono Lake Water and by a facultative arsenite-oxidizing chemoautotroph, strain MLHE-1.Appl. Environ. Microbiol. 68:4795-4802. Senn, D.B., and Hemond, H.F., 2002. Nitrate controls on iron and arsenic in an urban lake. Science 296:2373-2376.